Living Biblically is off to meet its maker. Deadline reports CBS has cancelled the new TV show after eight episodes. The sitcom stars Jay R. Ferguson as Chip Curry, an NYC film critic who decides to live a better life through strict adherence to biblical precepts. The cast also includes Lindsey Kraft, Ian Gomez, David Krumholtz, Tony Rock, and Camryn Manheim. Living Biblically premiered in February, and things have not been going well for the freshman comedy. So far, the show is averaging a .70 rating in the 18-49 demo and only 4.208 million viewers, making it CBS’ lowest-rated new series. CBS has pulled Living Biblically from the schedule effective immediately. What do you think? Have you seen Living Biblically? Do you think it should’ve been renewed? LOVED this show. The name almost had me passing it over without ever watching, but I was so glad I gave it a view. My husband and I watched it together. Being a Christian/Agnostic couple, that was very surprising, but a welcome treat to enjoy a show together. Wish it were still on. 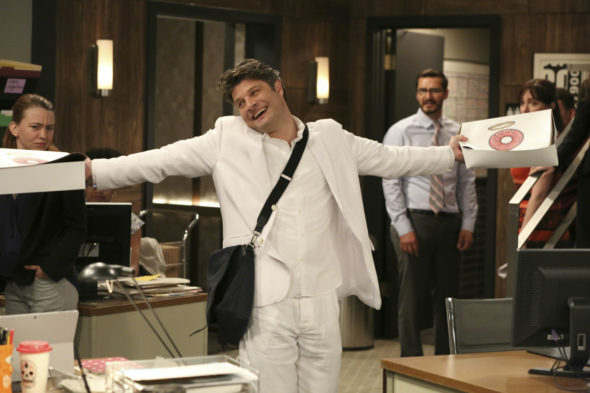 Please bring Living Biblically back! !